A Hinamatsuri afternoon tea will be held on Saturday, March 1, at 11 a.m. at the Japanese American National Museum’s Chado Tea Room, First and Alameda in Little Tokyo. Mothers, daughters, ladies (and men in their lives) of all ages are welcome to bring their dolls and celebrate Hinamatsuri. Known as Doll Festival or Girls’ Day, Hinamatsuri is a special day in Japan when families celebrate the health and happiness of their young daughters. Hina (dolls) will be on display for the duration of the event, only for event attendees. Special activities and giveaways included. $25 members; $35 non-members, includes museum admission. RSVP is required; 40 participants max. 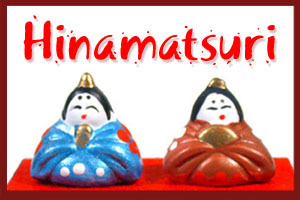 To see an article about Hinamatsuri in the United States, click here.